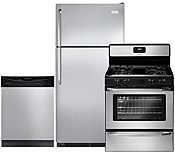 This 2 Pcs appliance bundle is a great deal for anyone who has small kitchen or simply starting off. Comes with a Danby 10 cu. ft. Top Freezer Refrigerator: 23.8" W x 26.44" D x 59.8" H , and a Danby 20-Inch Gas Range with 4 Burners. 26" W x 20" D x 43" H.
The Premier 30 in. 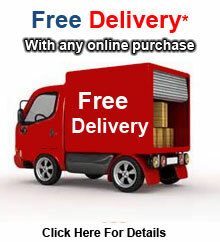 Freestanding Spark Ignition Gas Range is everything you want and nothing you don?t. 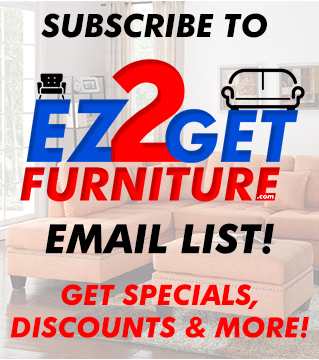 All Premier ranges are made in the U.S.A. and come with an Exclusive Lifetime Warranty on all Top Burners - Your assurance that you are purchasing a top quality product. 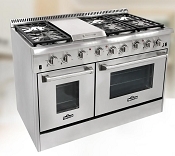 Equipped with a lift-up cooktop and support rod, removable (dishwasher safe) grates and removable oven bottom, this range is a cinch to keep clean. Our Fully Insulated Oven contains a Baffled Oven Burner that disperses heat uniformly and contains 2 Heavy-Duty Oven Racks with Stop Positions. The Universal Valves on all open burner models allow easy conversion from Natural to L.P. gas without additional parts or special tools. 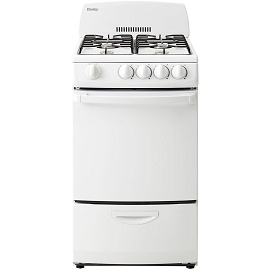 The GE freestanding gas range makes every meal you cook easier to prepare. The 12,500 BTU burner produces high heat fast. And when low heat is required, the Precise Simmer burner treats more delicate foods with care. The Under Cabinet Range Hood are designed to fit safely and stylishly underneath your existing cabinetry. 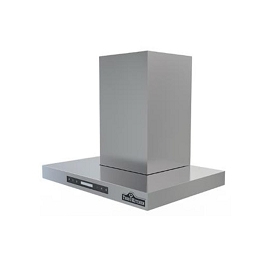 Multiple fan speeds, high quality stainless steel materials, and CSA certification ensure that these vent hoods will perform reliably and safely. The 36" European style under cabinet range hood features a stainless steel body with dishwasher-safe baffle filters for durability. The dual motors perform at a capacity of 900 CFM to handle heavy ventilation tasks. The incorporated gas sensor automatically turns the hood on when leaking gas is detected within the premises. 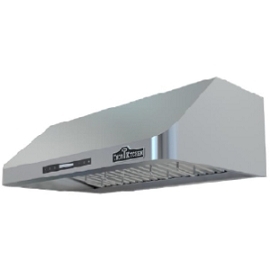 The 30" Stainless Steel wall mount range hood comes with 700 cfm/238W motor power to eliminate steam and odors from your kitchen. All that requires to regulate the hood performance is a touch of a button. The 2 LED lights provide enough lighting for you to enjoy your cooking experience any time of the day. The 30" under cabinet hood combines the exquisite design with performance and durability. The 900 cfm blower features powerful ventilation with low noise level while the stainless steel baffle filters come for long lasting performance. The 4 speed-power control allows you to set the needed ventilation speed for your cooking to eliminate steam and odors. 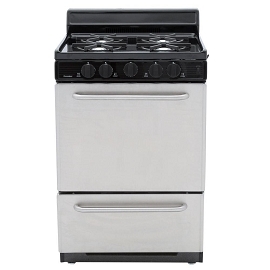 The Stainless Steel GE 30" Freestanding Gas Double Oven Convection Range features an edge-to-edge cooktop that gives you extra room for pots and pans of all sizes. Cookware moves easily from burner to burner. An 18,000 BTU Power Boil burner boils water fast with intense heat and a large oval fifth burner is ideal for a griddle. An extra-large integrated non-stick griddle cooks up to six grilled cheeses at once on the industry’s largest integrated griddle. With a precise simmer burner, delicate foods won’t burn with low, even heat. The lower gas convection oven circulates heat for high-quality results. The double oven’s 6.8 cu. ft. total capacity is ideal for big meals. The self-clean with steam clean option oven cooks more dishes at once. Heavy-cast, dishwasher-safe grates easily and safely clean in the dishwasher and a black gloss oven interior gives a sleek and clean appearance. 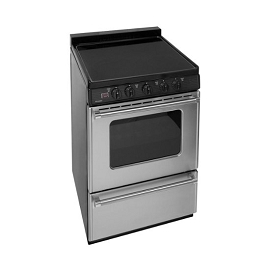 The stainless steel and black GE 30" Freestanding Gas Double Oven Convection Range features an edge-to-edge cooktop that gives you extra room for pots and pans of all sizes. Cookware moves easily from burner to burner. An 18,000 BTU Power Boil burner boils water fast with intense heat and a large oval fifth burner is ideal for a griddle. An extra-large integrated non-stick griddle cooks up to six grilled cheeses at once on the industry’s largest integrated griddle. With a precise simmer burner, delicate foods won’t burn with low, even heat. 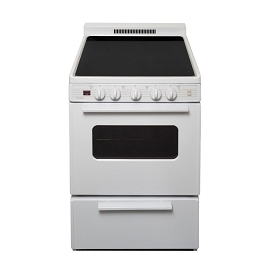 The lower gas convection oven circulates heat for high-quality results. The double oven’s 6.8 cu. ft. total capacity is ideal for big meals. The self-clean with steam clean option oven cooks more dishes at once. Heavy-cast, dishwasher-safe grates easily and safely clean in the dishwasher and a black gloss oven interior gives a sleek and clean appearance. Thor Kitchen 48" Gas Freestanding Range with 6 Burners, Sealed Burner, 4.2 cu. ft. 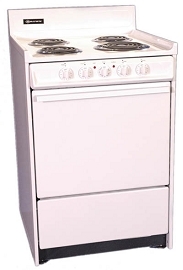 The 48" stain less steal freestanding gas range combines all your cooking needs into one unit. 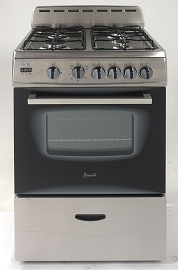 It features two ovens for simultaneous cooking, and a 6-burner cooktop with different power BTUs. The incorporated griddle diversifies the cooking options even further. Thor Kitchen 36" Gas Freestanding Range with 4 Burners, Sealed Burner, 5.2 cu. ft. 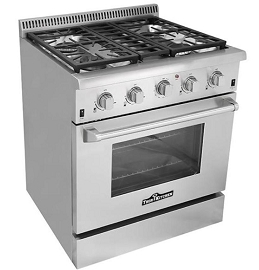 The 36" Stainless Steel freestanding gas range is designed to provide the power of commercial ranges to home kitchens. It comes with a large 5.2 cu. ft. convection oven for even cooking and better performance. The cooktop features 4 burners and a griddle to make it possible to realize any culinary project. The automatic ignition and re-ignition provides convenience and added safety. Thor Kitchen 36" Gas Freestanding Range with 6 Burners, Sealed Burner, 5.2 cu. ft. 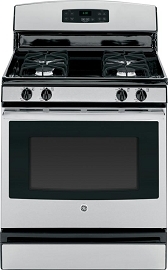 The 36" freestanding gas range features a large 5.2 cu. ft. oven with commercial convection fan for outstanding cooking results. The cooktop hosts two dual burners with 15000 BTU power and 4 single burners to deliver the right heat for your culinary imagination. The cast iron flat cooking grates can host large pots and make it easy to move them around. Thor Kitchen 30" Gas Freestanding Range with 4 Burners, Sealed Burner, 4.2 cu. ft. 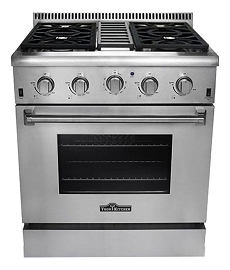 The Stainless Steel 30" freestanding gas range features a large 4.2 cu. ft. oven with commercial convection fan for outstanding cooking results. The cooktop hosts two dual burners with 15000 BTU power and 2 single burners to deliver the right heat for your culinary imagination. The cast iron flat cooking grates can host large pots and make it easy to move them around. 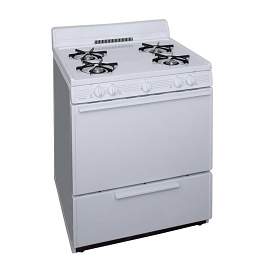 The 30" freestanding gas range features a large 4.2 cu. ft. oven with commercial convection fan for outstanding cooking results. The cooktop hosts a dual burner with 15000 BTU power and 3 single burners to deliver the right heat for your culinary imagination. The cast iron flat cooking grates can host large pots and make it easy to move them around.